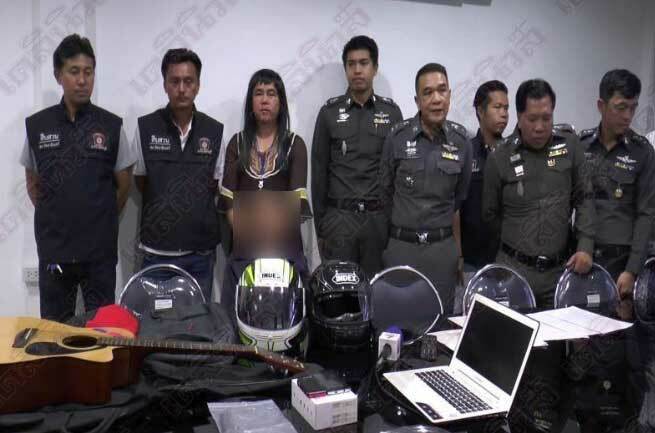 BANGKOK: -- Cops in northern Bangkok nabbed a gang stealing property at knifepoint with some imaginative proactive policing. Following several cases of theft from women, station chief Kitisak Thiangkamon ordered his underling Wiwek Kamonwiboon to dress as a woman, reports Daily News. That's him in the picture looking every bit the part! Wiwek found a wig and a dress and started wandering in quiet areas where the gang were operating and it was not long before his charms managed to hook the thieves. He was approached by two youths on a Honda Wave and immediately called for back-up who swung into action. The youths - aged 17 and 18 - were arrested and it was not long before they had admitted to a string of thefts using a knife and a box cutter. Police had realized a gang was operating in the Rattanathibet area targeting women. On the 7th of this month a woman had her computer notebook stolen at a bus stop outside a department store. Hours later there was another attempted theft nearby. Then a woman was robbed of a digital camera and some money at the end of Soi 18 in the same neighborhood. All the offences were identical. So police decided to entice the miscreants with officer Wiwek's helpful disguise. One of the youths was found to have previous with two thefts at a 7-11 store and outside the ministry of trade. Both villains were charged with theft with menaces during the hours of darkness and detained. Enough to scare off any would-be purse snatcher. Thankfully she wasn't sexually assaulted. They made him wear the costume for the picture. That disguise would not have fooled Thai Visa's detective brigade, although if this had been in Pattaya, I am sure some of the farang ladyboy lovers would have propositioned him. looks like Corporal Klinger. Wonder why hers his hands are blurred out on the picture? And that thing about line up photos with criminals is against the law did not last very long. I think that is one of the suspects head. OK, missed that need new reading glasses. Underling? Is that a police official title? One day they may have real women police officers! But this is funnier, like something from a Carry On movie. Oooer missus.